Grab your canvas shopping bag, eco-friendly coffee cup, and carpool to work because today marks the 40th anniversary of Earth Day. It’s a day to show our appreciation for the environment and to think about how our daily activities make an impact. In the past week we’ve all been reminded of the power of Mother Nature with the eruption of Eyjafjallajökull. With one fail swoop, Europe was at a standstill: no flights, canceled meetings, empty conferences, and thousands of stranded passengers. 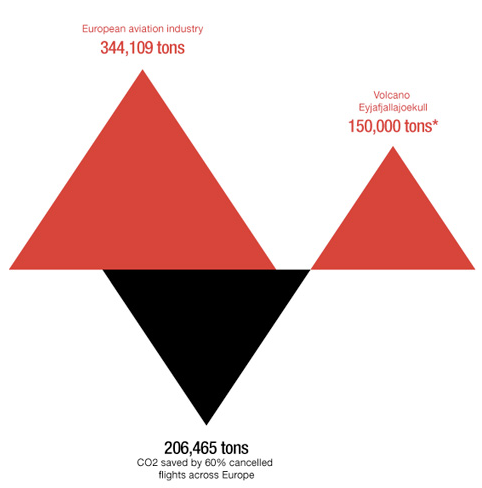 One fact that I find particularly relevant to Earth Day: the CO2 emissions from the eruption itself are significant, but dwarfed by the savings from mass groundings of flights (see daily emissions comparison below). 1) Instead of spending hours driving to a meeting, plan a video conference. If you’ve got any other suggestions, we’d love for you to post them here. If you’re interested in learning more about Earth Day, visit http://www.earthday.org/.